Lazada is one of the most trusted big names to offer products from a to z on their modern e-commerce platform. 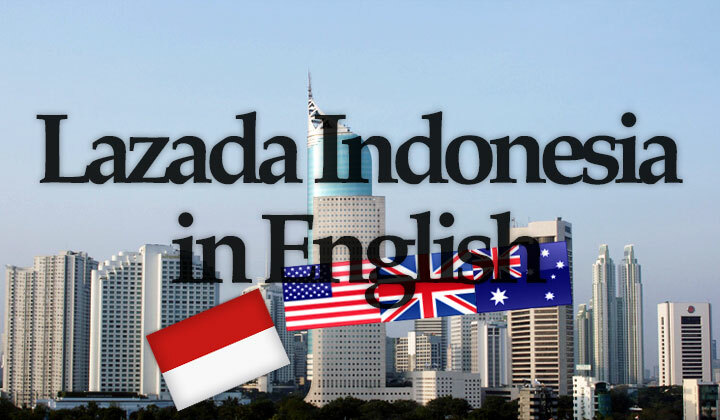 This is a guide to English language shopping on Lazada in Indonesia. Please, leave questions below. Guide mended as required. Thank you. Indonesia is slowly emerging as the next big market for e-commerce in Asia. Companies like Lazada have penetrated the country early, catering to Indonesia’s mobile dominant and small to midsize business abundant retail business. Now 70% of internet users in the country use mobile phones, pushing modern web design standards and revolutionizing consumer culture. They also have a popular online shopping app with more than 20 million downloads to date. Perhaps one of the company’s biggest strengths is in their convenient seller portal, which acts as a marketplace for anyone to enter online sales in Indonesia. At the time of writing, more than 4000 partners are using the marketplace platform. Currently no native English version exists and the store located at Lazada.co.id is only available in Indonesian. However parts of the website remains mixed with English language and there are easy ways to do a live translation in order to navigate the site mostly in English with ease. A new Edge extension from Microsoft is available for Windows 10 with easy to use, intuitive system for quality translate with the Bing’s translator software. Make sure that your Window is up to date and go to the App Store to search for “Microsoft Translator” where you can install and enable the free extension. You will see a new icon in the toolbar where you can translate between 50+ languages — not just from Indonesian to English. Translations are completely automatic and will securely convert all pages from registrations, product descriptions to account settings to your desired language. Chrome users have it easy as automatic translation feature comes ready installed. What’s important to understand is that it only suggests to translate web pages that are in a different language than the Chrome browser is using. So let’s say that your Chrome interface is in English and you enter www.lazada.co.id in the address bar, as soon as the page is loaded it will popup with a question asking you to translate the page, and if you want it to be automatic for the website in question. It’s important to set it to auto mode so that each page is translated as you go. Lazada has become the biggest name in B2C (Business to consumer) electronic commerce in large parts of Southeast Asia. The end user, in this case the Indonesian public have embraced online shopping on a whole new level. Originally, a German company known as Rocket fueled the first year of the company’s establishment in the country but now Lazada works independently for the most part. Now reaching towards the number one spot as the largest Indonesian ecommerce site with a brand name that has gained global trust and recognition over the years. The website is competing against companies like MatahariMall, Bhinneka, BliBli, Zalora, Berrybenka, Paraplou, Bobobobo, Tiket, Traveloka, Groupon, Grivy, OLX Indonesia, Jualo, Lamudi, Rumah123, Rumah, Carmudi, Mobil123, Kaskus and many others. Where only a handful to which Lazada belongs, have targeted the “Amazon-like” status of a to z offerings together with a seller platform that any business can utilize for their success. Thank you for reading, comments, questions below please! Is it possible to buy items on the Lazada website and have them posted to Australia . No, unfortunately they can ship to locations in Indonesia only. I suggest downloading Google Chrome and using it instead. Works fine on Windows 7. Or, you can just use an older Internet Explorer browser, and copy paste to Google Translate. Please, let me know if you have further questions..! There is no need for copy, pasting with Chrome. When you enter “Lazada.co.id”, it should prompt you with a question, “Translate this page?” (for a few seconds), simply click on the blue “Translate” button and everything will convert to English, automatically. Note, that if Windows is in Indonesian, it will not ask you this. Also, if you are not seeing the translate prompt, you can simply do a right click when on the Lazada website, and select “Translate to English” from the menu. Or, if Windows is in another language it will offer that. I’m happy to answer further questions. I have tried to reach Lazada customer service in English, as someone is using my emailadress for their account at Lazada. I am from Holland and do not speak Indonesian. Unfortunately I got no response but I’m worried about someone using my mailadress. How can I contact Lazada in English to solve this?